Titanium pedal axle for the left hand folding pedal. This titanium axle is saving 21-30 grams over the original, depending on whether it's compared to the new or old version of Bromptons original steel axle. Since 2012 Brompton have discontinued making the titanium pedal axle for the superlight titanium models - so here it is, in a Brompfication version. The axle is made from titanium grade 5, and can replace all versions of Bromptons original axles. Due to a design close to that of Brompton's new version, this axle is also 5 grams lighter then Bromptons now discontinued titanium version. This is how you can see what version of the axle you have - Brompton's old steel version utilise an axle with a 24 mm flat hexagon head and weight 48 grams. 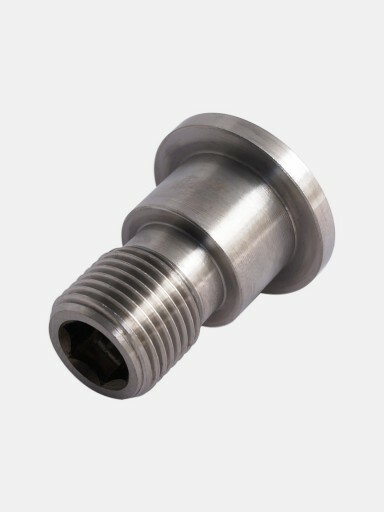 The new steel version has both an 8 mm hexagon socket in the head and a 6 mm in the threaded end, and weight 39 grams. The discontinued titanium axle has a 10mm hexagon socket in the head, and weight 23 grams. Pedal Axle: 9/16" 20 TPI left hand tread with a 8 mm hexagon socket in the threaded end.